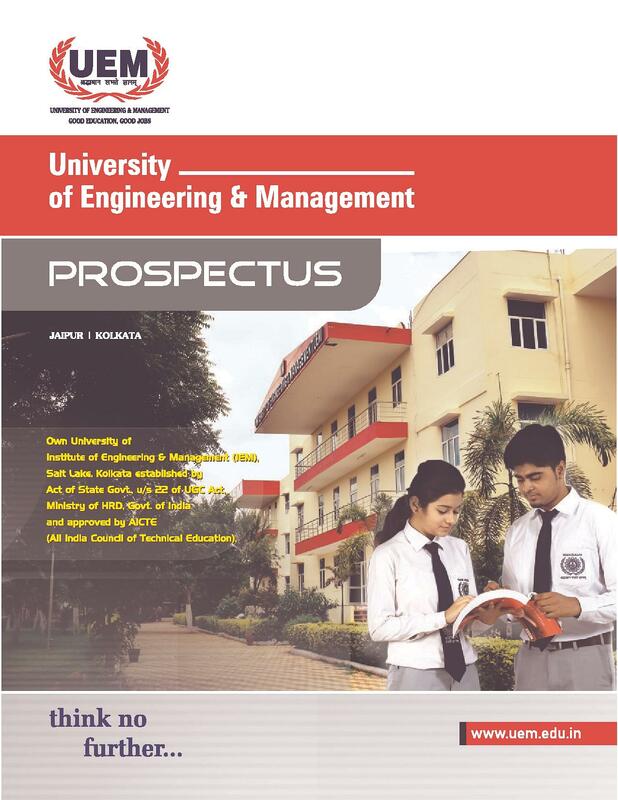 University of Engineering and Management (UEM), Jaipur is a Private University which was established under the Act no. 5 of 2012 of Government of Rajasthan. 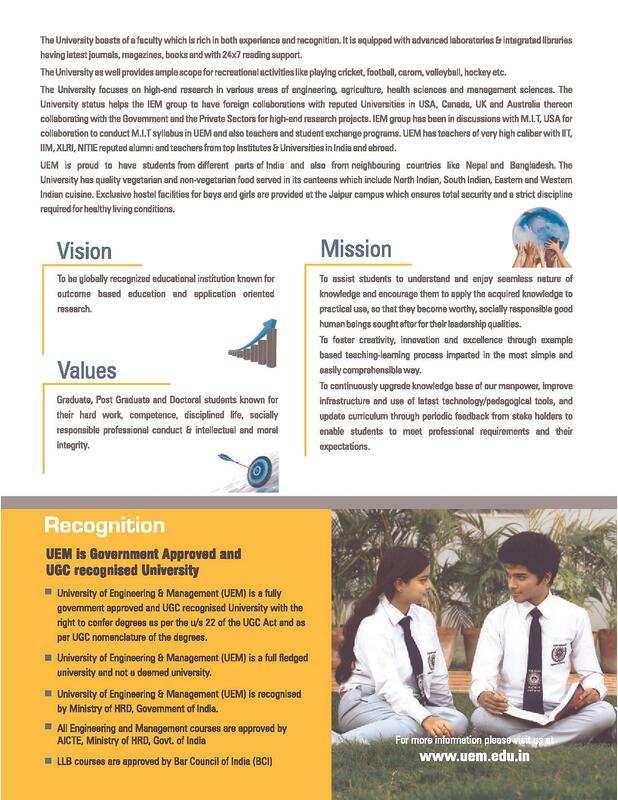 The University is approved by University Grants Commission (UGC) and All India Council for Technical Education (AICTE). 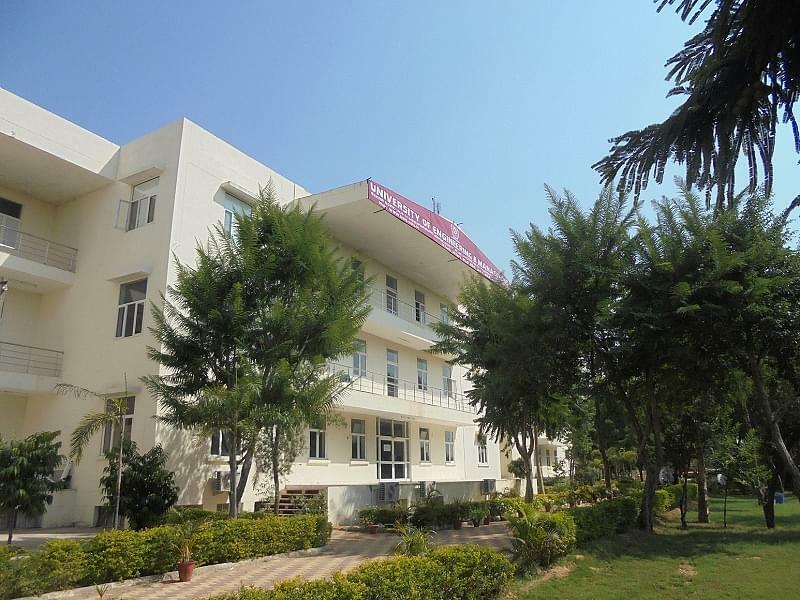 It is also a member of Association of Indian Universities (AIU) and is accredited with “Grade A” by National Assessment and Accreditation Council (NAAC). UEM offers various Undergraduate, Postgraduate and Doctoral programs through IEMJEE examination. 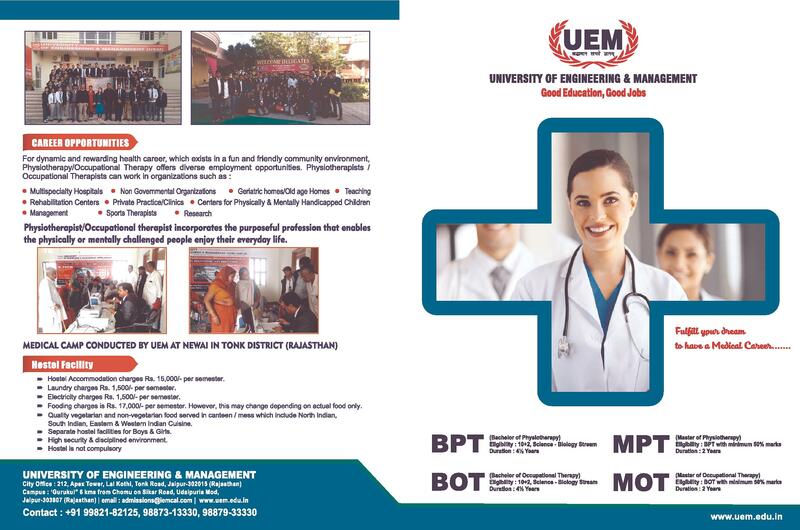 UEM Jaipur offers B.Tech, BBA, BCA & BPT programs at UG level and M.Tech, MBA & MCA programs at PG level. 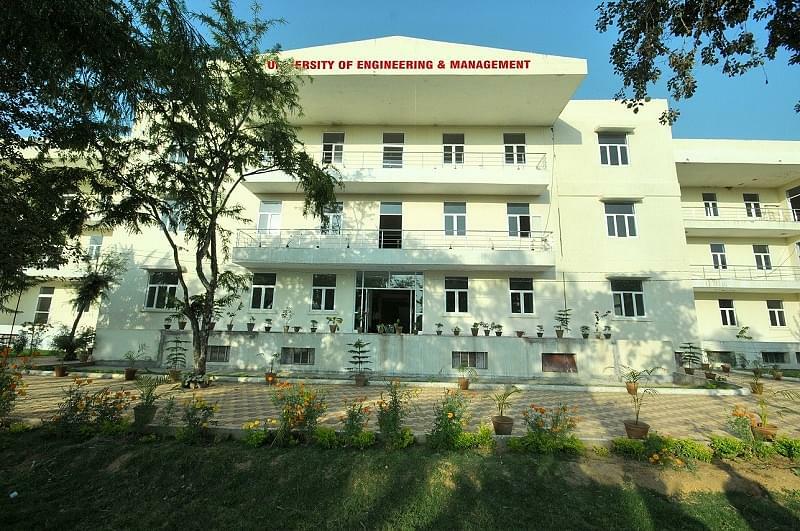 UEM, Jaipur also offers a Ph.D. program in the disciplines of Engineering, Management and Humanities along with the part-time MBA program for Executives. Passed 10+2 and must have Physics, Chemistry, and Maths as compulsory subjects. Passed 10+2 and must have Physics, Chemistry, and Biology as compulsory subjects. Passed class 12th with Mathematics, Stats, Computer Science, Computer Application, and Business Mathematics as one of the compulsory subjects. Passed class 12th with Physics, Chemistry, Biology/Physics, Chemistry, and Mathematics. B.Tech or M.Sc degree in relevant discipline is required. 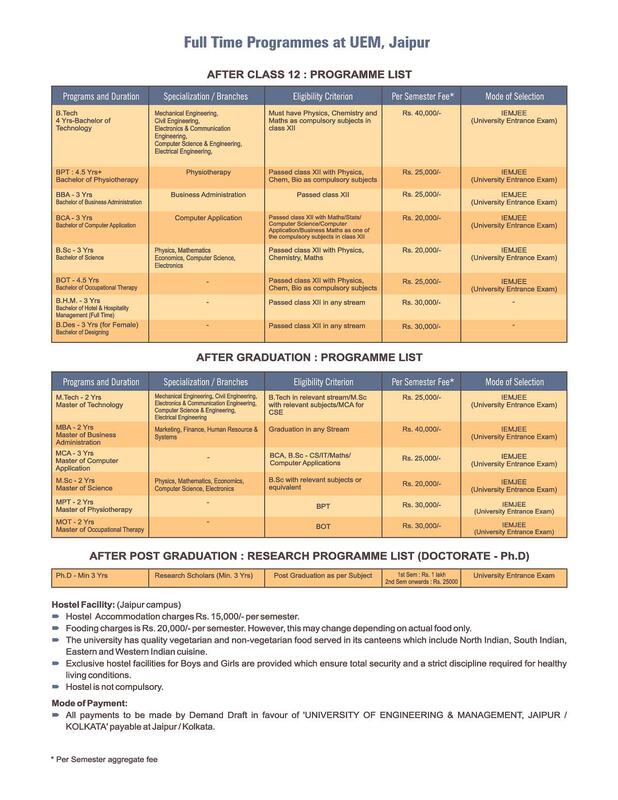 BCA or B.Sc degree in Computer Science or Information Technology as main subjects. B.Sc. degree in relevant discipline is required. 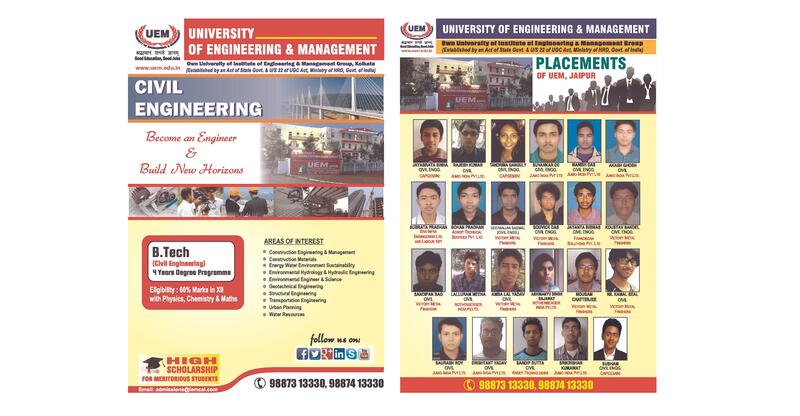 UEM Jaipur Placements cell has got its students to receive more than one job offers while graduating. 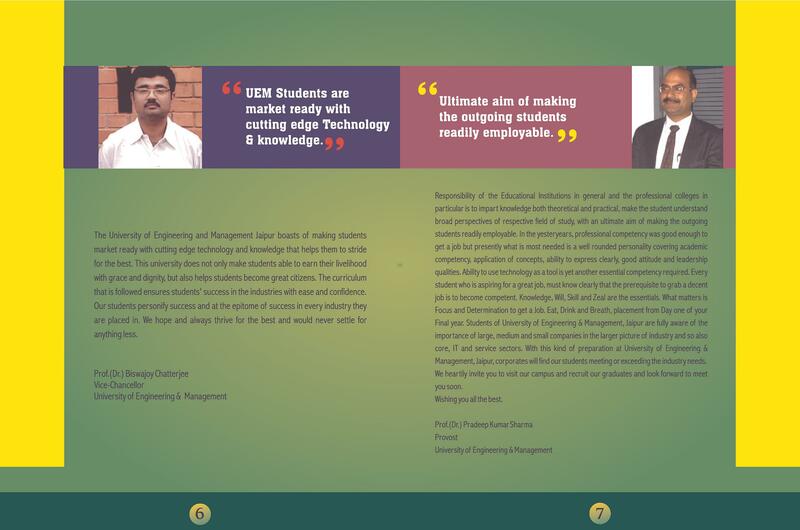 This shows the capabilities and enthusiasm of students along with recruiting companies coming to UEM campus for placements. 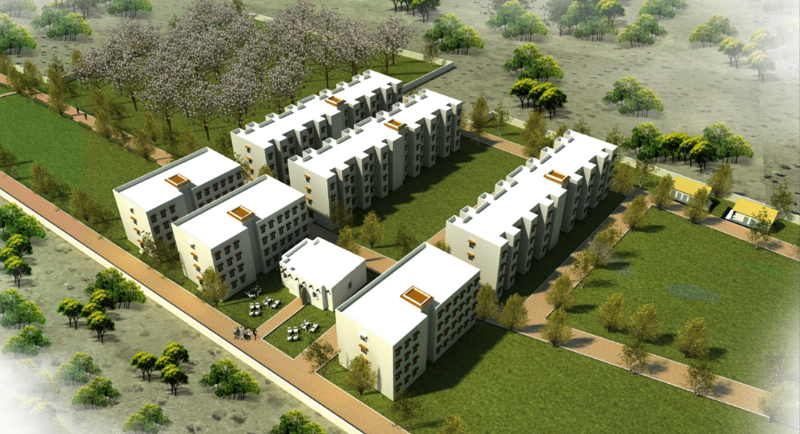 From the past 30 years, all UEM Jaipur students have received 1 to 2 job offers on an average. More than 76+ companies have participated in UEM Jaipur campus recruitment. The placement stands at 123.22% (in the ratio of the number of job offers to the number of students interested for placement) in April 2019 (6 months of placement season still remaining). 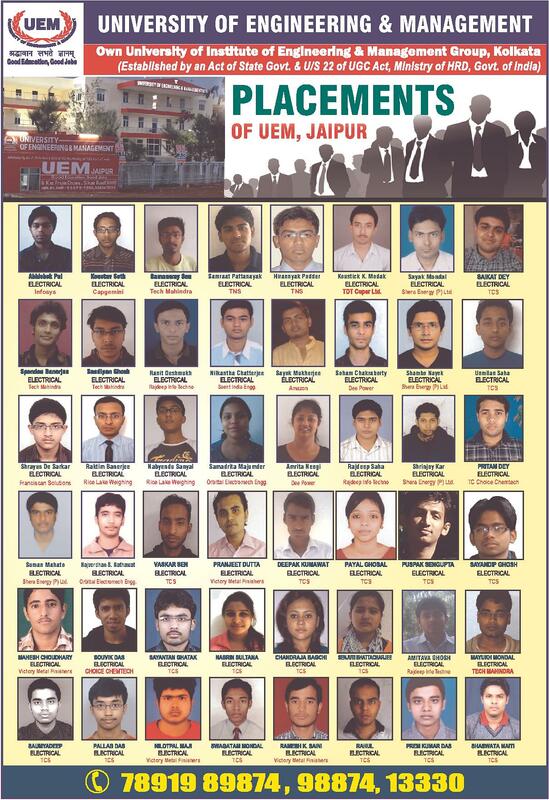 3 students of UEM Jaipur got job offers of Rs 12 lakhs per annum, and 24 students got 3+ job offers. TCS, Cognizant, Wipro, Aimil Ltd, Agile Infoways, Appcino, Franciscan Solutions, MKC Infrastructure, Trinity Global Tech, TNS, Kriti Technologies, Linkruit, Ramya Reprographic Pvt Ltd, Prototech Solutions, Atmecs, Apatara, Elektrolite Power, Ongraph Technologies, Mangal Electrical Industries Pvt Ltd, Bergen Group, KMG Infotech, Smart School Education Pvt Ltd, Hexaware, Watertech Engineers Pvt Ltd, In Time Tec Visions Pvt Ltd, Metacube, NETpro Systems, 221B Baker Street, Swajal Water Pvt Ltd, Cape Electric, Sood Tower, Simply force Technology, Paradise Tiny Tots, Marketing Mindz, Sunrays Image Technology, CapitalVia Global Research, Global Logic, Rajdeep Info Techno, Extramarks Education India Pvt Ltd, Vaibhav Global Ltd, Itenic Technologies, Mindtree, Fexle Services Pvt. Ltd (Simply Force), Hinduja Global Solutions, Allianz Partners, Reliance Capital, Brill Techno Pvt. Ltd., Insta Medico & It Services (Divine Communication), Experis IT Pvt Ltd, Hyper Filtration Pvt Ltd.
Best Private University in Rajasthan by National Education Excellence Awards 2016. Best Emerging Private University in Rajasthan by Asia Education Summit & Awards 2016. Most Innovative Private University by DNA News Group, BBC News 2017. 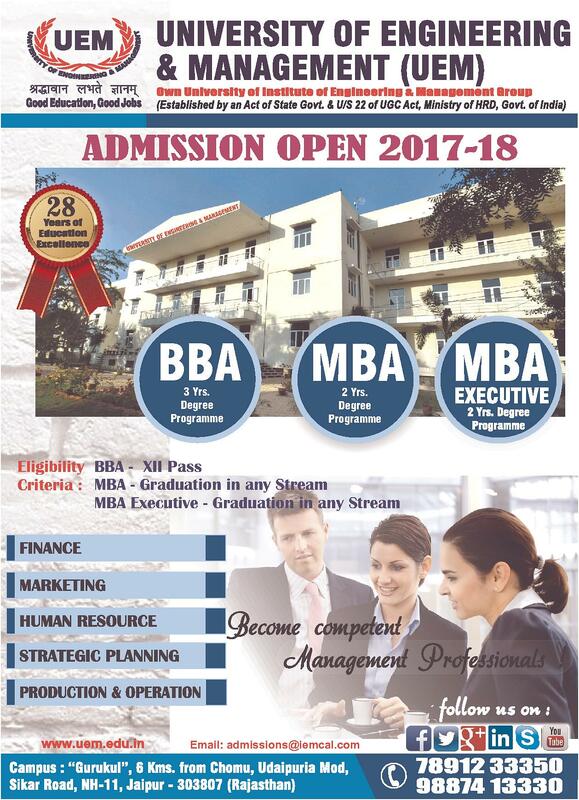 Best Private University in Rajasthan by Global Education Awards 2017, Prime Time. Education Excellence Award by Competition Success Review 2017. Internationally Recognized in Malaysia by Golden Globe Tigers Awards 2017. National Education Awards for Quality in Education by ABP News 2017. Most Trusted University of the year by International Education Award 2017. Awarded Education Excellence Award by 24 Ghanta TV News and ZEE Network for Best Placement, Domestic and International Engineering and Management. 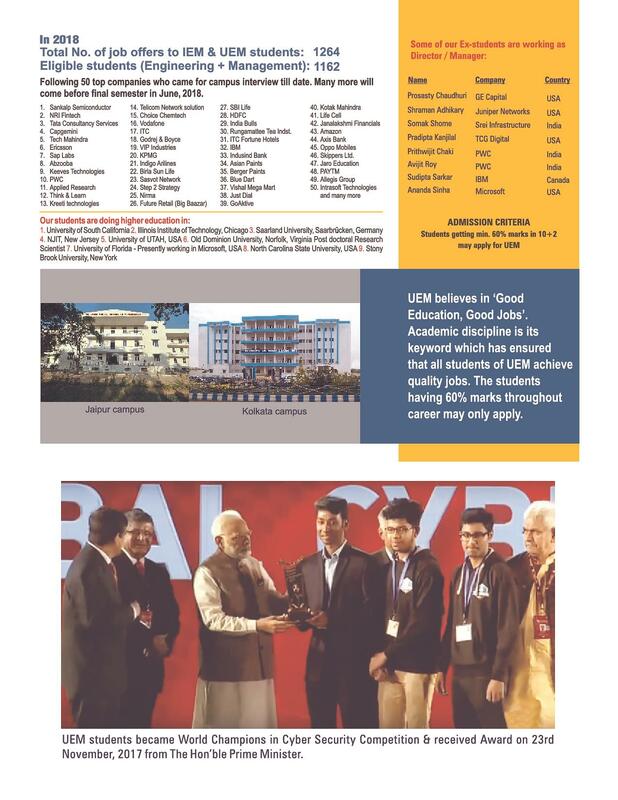 Awarded as Best Placement University Award in Global Education Achievers Award in the year 2019-2020. UEM Jaipur is rated the topmost (Rank 1) the University of Rajasthan for 3 consecutive seasons by Ministry of HRD, Govt. of India - NPTEL exam initiative. UEM Jaipur has won the "University with Best Placements" in the Global Education Summit, 2019. UEM won the ‘Best Debutant Award’ in NEN (National Entrepreneurship Network) E-Week (Entrepreneurship Week) in 2015. UEM won the ‘Champions Runner-up Award’ amongst all colleges and universities of Western India in NEN E-Week in 2016. The students have developed their own multi-terrain vehicle and motorcycle for representing India at international competition BAJA SAE. The students won the first prize in Hacking championship and Robotics Championship at IIT Delhi. UEM students won the 1st prize in the National Students’ Space Challenge 2016, IIT Kharagpur Award, NIT, and Rourkela. UEM, Jaipur students won first prize in National Kart Racing Championship 2017 in Rajasthan. UEM student became world champion in IEEE Maker Project, USA by inventing a gaming console. 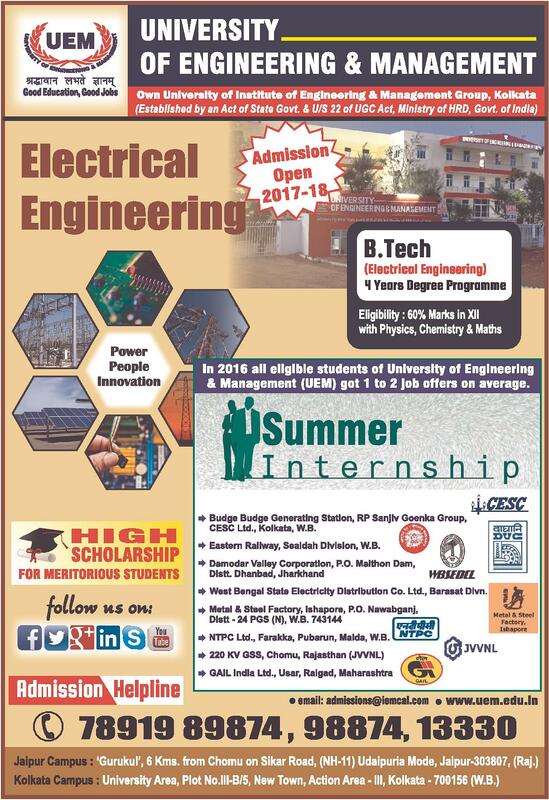 UEM Jaipur Scholarships are offered to the Meritorious Candidates on basis of their marks in the previous qualifying Examination. 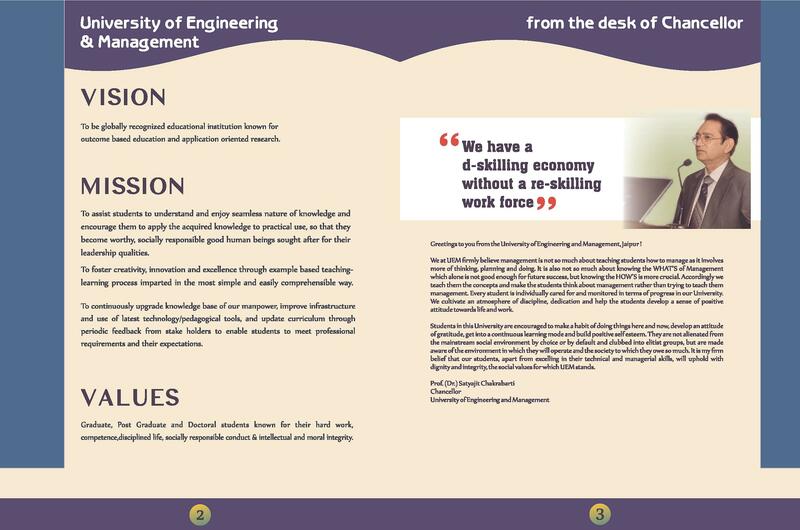 We get every facility in our college which we want from management but they never compromise with the study system. 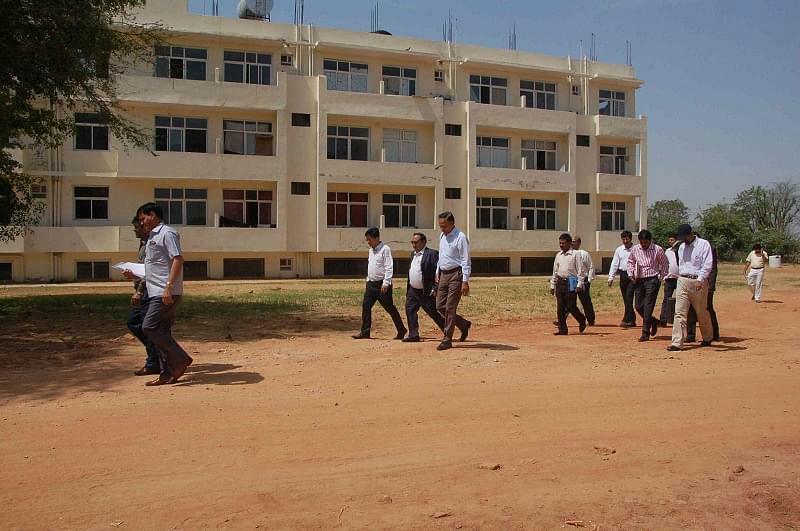 Overall this University is good place to Learning and Established our Innovative Ideas through out our Program career with the motivation of our Teachers. I m the student of UEM, Jaipur. The college is very good and provides great opportunities in the field of physiotherapy. 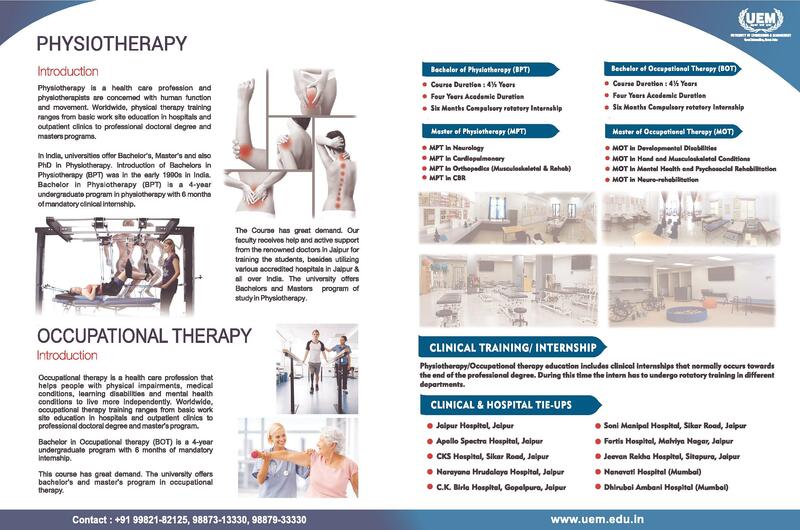 I feel good that my UEM Jaipur is now a well-known name in the field of physiotherapy, I, as a student, have attended several physiotherapy conferences and I was also one of the winners. 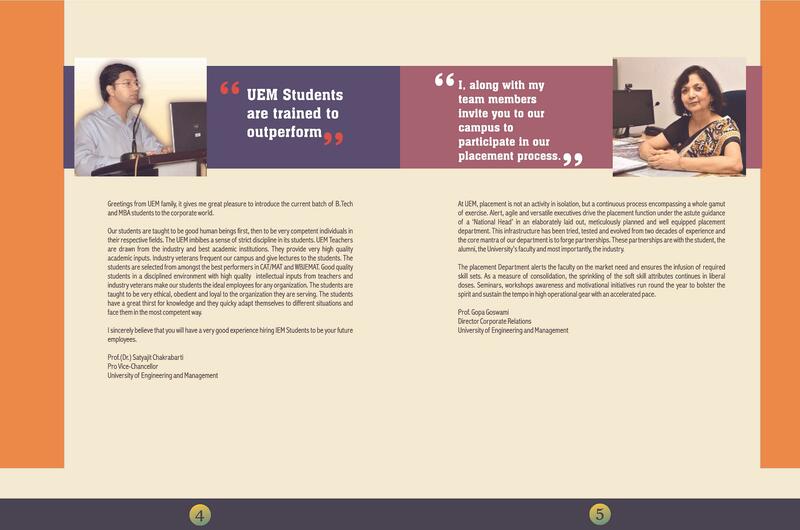 In a nutshell Studying in UEM is one of the best thing because besides of shaping you into a professional one it also enhances your etiquette, attire and makes you one complete package to have a blasty future ahead. 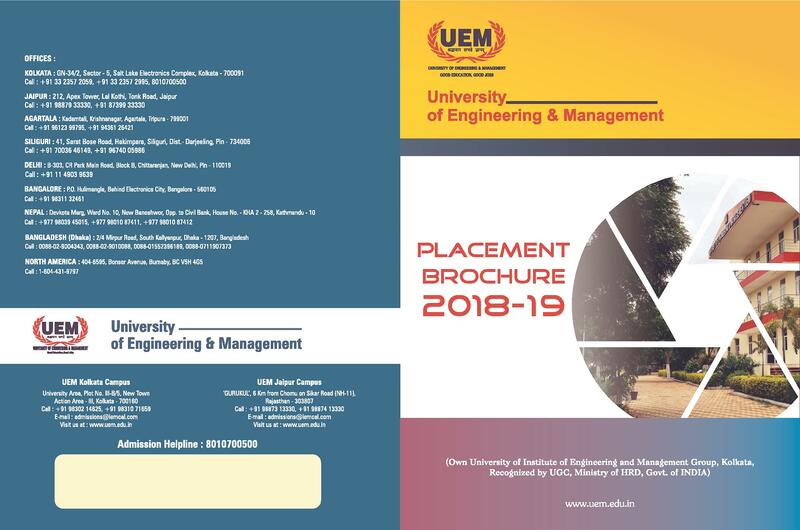 University of Engineering and Management (UEM) is known for its excellence in engineering and management education and great placement offers. BMW has sponsored transmission engine worth Rs 14 lakhs, free of cost to setup a laboratory at the University of Engineering &amp; Management (UEM), Jaipur. 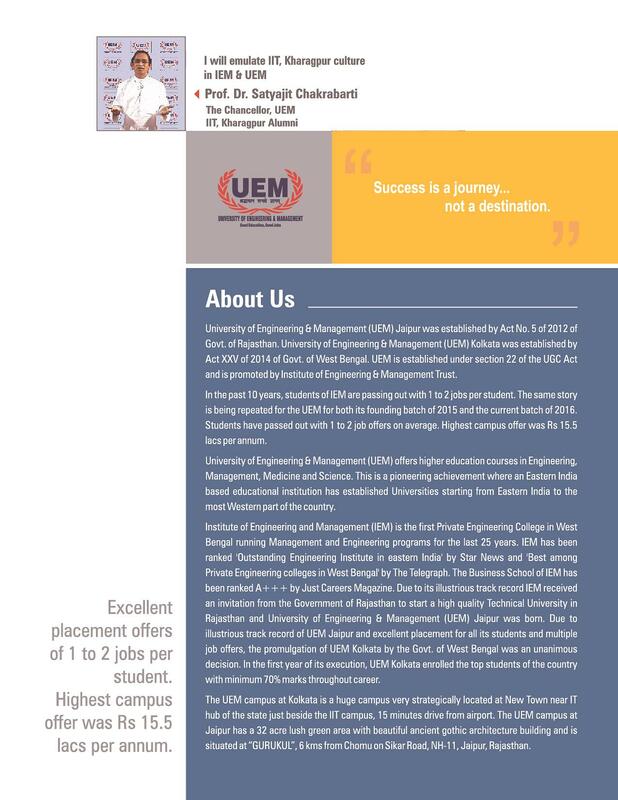 Iemjee exam Uem being the private university under IEM group has a name besides IEM kolkata is considered as best college in North India That's why i chose UEM over others. Joined this college after completing Diploma in mechanical engineering in 2016 . I find this college better than other colleges and joined this colege. "An awesome place to cherish for the rest of my life"